Kyle Busch has won the NASCAR Cup Series race at Chicagoland Speedway, holding off Kyle Larson on a wild final lap. It was Busch's fifth win of the season and No. 48 for his career, matching Herb Thomas for 14th on the Cup Series' list. Busch moved into the lead on a restart with 58 laps to go, replacing Kevin Harvick at the front of the field. A hard-charging Larson passed Harvick, but he brushed the wall with seven laps left. Larson kept going and was neck-and-neck with Busch on the final lap. They made contact a couple times, but Busch brushed him off on his way to the victory. Busch was booed by the crowd when he got in the car. But Larson felt it was a fair finish. 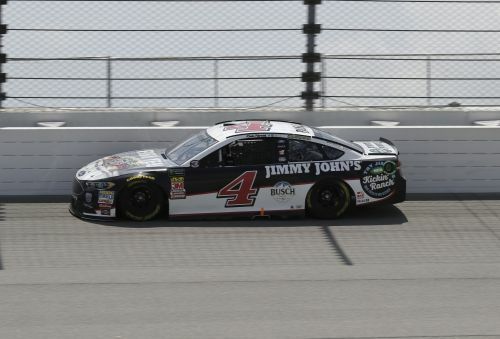 Kevin Harvick has won the second stage of the NASCAR Cup Series race at Chicagoland Speedway. Harvick went all the way up against the wall to pass Stewart-Haas Racing teammate Kurt Busch near the end of the last lap of the stage. Harvick is going for his sixth win of the season. Kyle Larson was third, followed by Martin Truex Jr. and Ryan Blaney. Larson is trying for the weekend sweep after winning the Xfinity Series race on Saturday. Busch is looking for his first win of the season in his No. 41 Stewart-Haas Racing Ford. His brother Kyle has won four times. Aric Almirola won the first stage and was in the lead before he had to pit on Lap 143 for a loose wheel. Aric Almirola has won the first stage of the NASCAR Cup Series race at Chicagoland Speedway. Almirola began the day in the No. 6 position. It was his first stage win in the series. Kyle Larson was second, followed by Martin Truex Jr., Kurt Busch and Kevin Harvick. Truex is going for his third straight win on the 1.5-mile oval in the Chicago suburbs. He had to start at the back of the field after his car failed inspection following qualifying. Dale Earnhardt Jr. is set for his first NASCAR Cup Series broadcast, and Junior Nation is ready. A steady stream of fans stopped at the NBC Sports set before the race at Chicagoland Speedway. One man yelled "Go get 'em Dale!" as Earnhardt fulfilled his TV duties. Earnhardt, a two-time Daytona 500 champion, retired at the end of last season and won his 15th straight most popular driver award. Extreme heat is a concern again as NASCAR closes out its annual weekend at Chicagoland Speedway. Rain could become a factor, too. There are scattered thunderstorms in the forecast for the NASCAR Cup Series race on Sunday afternoon. Paul Menard is set to start from the pole, and Martin Truex Jr. is going for his third consecutive victory at Chicagoland Speedway. Temperatures were in the 90s for the Xfinity race on Saturday, and it reached well into triple digits inside the cars. Drivers put bags of ice in their suits and splashed cold water on their faces during pit stops.